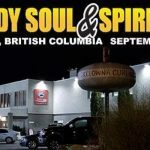 Body Soul Spirit Expo in Kelowna September 7th to 9th, 2018 is days away. Our Staff will be heading out Friday to get our table all set up for your visit! We will be giving a talk each day entitled All Ready To Go, so please do let your friends and family know we are heading your way.